My younger brother Kevin shall fix this - and soon I hope! :) I'm borrowing a computer at the liberary, but can't sit for too long. 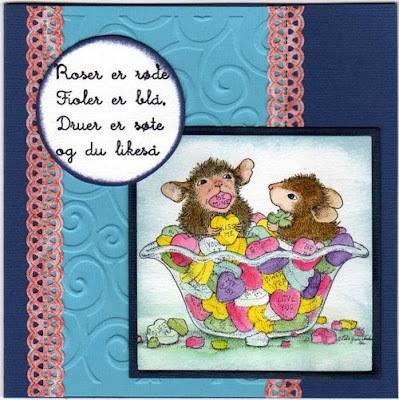 Snart er det Valentins Dag, så jeg må vel begynne å lage noen sukkersøte kort ;) Men jeg er ikke så glad i rosa akkurat... men man MÅ vel ikke ha rosa eller rødt med? *lol* Dette er laget etter skissen hos den nye challengebloggen The Sugar Bowl. Challenge 1 - Sketch by Tiets. Stamps/Image: SugarNellie 'Simon & Lola' by Rachelle A. Miller. Magnolia 'BakgründsSwirl bröllop' stamp. Valentine textstamp by Cat's Pajamas. Paper: Misc Bazzill cardstock, & Scrap papers. A vintage-looking card with a lovely old-fashioned photo-stamp from the Stampsmith. I made this after a sketch from the last challenge on the norwegian blog Sukkersött. 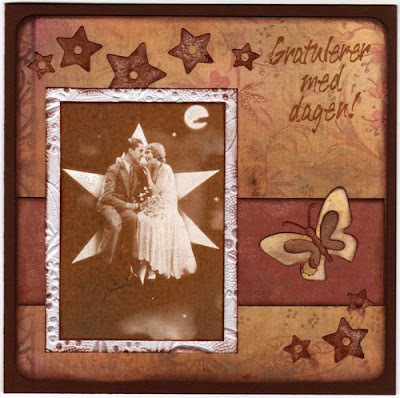 Stamps/Image: Photostamp 'Love under the stars' by the Stampsmith. Text-stamp from Kort & Godt - says roughly translated 'Congratulations on the day'. Thinking this could be a card for a wedding day or anniversary. Paper: Bazzill. Misc scrap-papers, think the red one is a BG paper. And the background is from DCWV - Once Upon a time Collection - Fairy Dust Glitter Cardstock. Embellishments: Glimmermist, QK Butterfly KS-0172, and Stars DooDads RS-0398 dies. 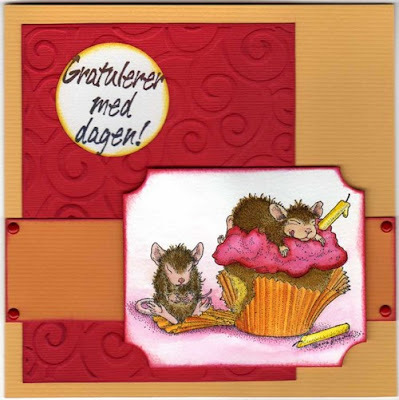 Stamps/Image: Lovin' Mousefull & Birthday Cupcake from House Mouse. The first text-stamp I can't recall the makers of, second reads 'Happy Birthday' and is from Kort & Godt. Embellishments: The paper-ribbon is from Scrappers Choice, and theres MM brads. And I've used the swirly Cuttlebug embossing folder. ë Framed Friends stamps at Stampin' Away the Day! This closes January 6th. 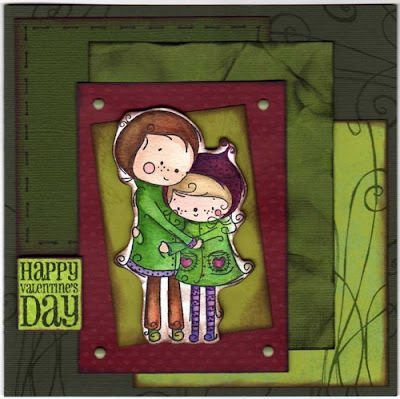 ë Cute Valentine ReMix stamps from Starving ArtiStamps - also closes on January 6th. ë Ribbon Candy at Creative Antics - guess how many ribbons! How fun! :) Ending on January 9th. ë A sweet skunk stamp and texts to fit can be won at Scrap, Stamp and be Merry. Ends January 8th. ë Loads of goodies can be found at Papercrafts by Rach. Ending on the 10th of January.